National Service Scheme started functioning in our college since 1984 with a single unit, and later an additional unit was allotted in 1986. The advisory committee of NSS consists of Principal, representatives from management, Bursar, Ex-programme officers, Staff Secretary, College Union Chairperson, PTA Vice President, Panchayath Ward Member, Volunteer Secretaries and Programme Officers. The two units of the college consisting of 200 volunteers regularly organize various activities under the leadership of programme officers and volunteer secretaries. The motto Not Me, But You reflects the essence of democratic living and upholds the need for selfless service and appreciation of the perception of an individual. National Service Scheme helps to develop the personality of Students through community service. NSS serves to create awareness and inspiration in citizens and provide opportunities for students to step out of their comfort zone into less privileged and weaker sections of the society. The unit won Indira Gandhi State Award for the Best Unit and the best programme officer award in 2000-2001. Ms. Jesty Pauly was awarded Best NSS volunteer award in 2015-16. The unit releases newsletter Handza Servze which covers the yearly activities and a manuscript magazine, which provides an opportunity for the students to produce their creative talents. Every year NSS activities begin with the official inauguration by eminent personalities. The organization observes important days and conducts various activities in regard with the same. Some of these days include World Environment day, NSS day, Independence day, Anti Drug day, World Population day, Women Empowerment day, Sadbhavana Divas, National Unity day, World AIDS day, Bamboo day, Human rights day, National Youth Day, International Peace Day etc. The NSS unit of our college plays an important role in organizing various awareness programmes in association with certain legal authorities and NGOs. As a part, the unit arranges Road shows, skits, rallies and talks. Students are provided proper orientation during their initial period of service. Seven day special camp is organized in the adopted village in collaboration with local governing bodies. Most often the NSS unit takes part in building home for poor, road construction and awareness classes. NSS also organizes skill development programmes on umbrella making, soap powder making, flower arrangement etc. NSS unit actively participate in Nationwide Swach Bharath mission by prime minister. Volunteers cleaned Panchayath, college premises, Angamaly railway station, Adopted village and TELK junction. In association with Regional Blood Bank Aluva, Blood donation campaigns are organized in college campus. As a part of Share a meal project, NSS unit have been successfully providing noon meals on all first Fridays of every month for the inmates of Abhayabhavan- A home for homeless at Koovapady. 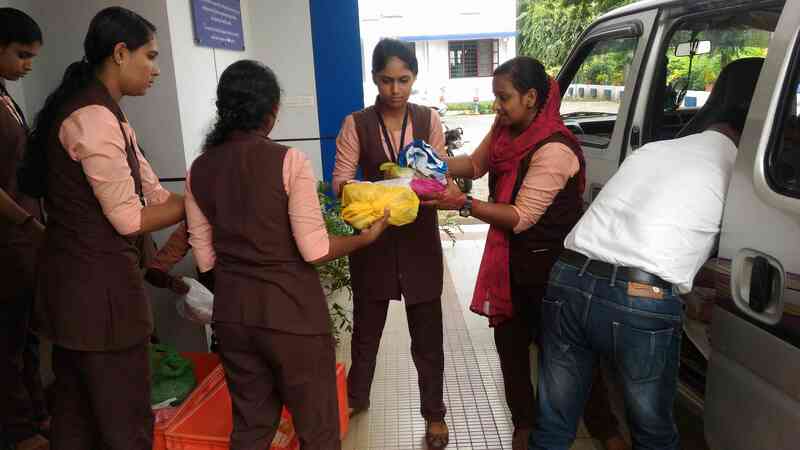 Around 300 lunch packets are collected from staffs and students. This project aims at developing sharing mentality and a concern towards the poor in students. For the benefit of society, NSS unit also organizes medical camps like cancer detection camp, eye testing camp, organ donation camp etc. Students are given training on civic laws and selected as approved paralegal volunteers. These volunteers assist advocates in legal aid clinics of grama panchayaths, preporatory works of adalath and reporting cases in police stations. Our volunteer serves as volunteers for Viomithram programme organized by Samoohika Suraksha Mission. NSS unit organizes State level, Inter Collegiate level and interdepartmental programmes and competitions throughout the year. As a part of commemorating the Birthday of Former Indian president, Late Dr. A.P.J Abdul Kalam, NSS Unit Organizes a one day Inter- Collegiate Programme in October. The programme consists of Inter- Collegiate Level Power Point Presentation competition on the topic A.P.J Abdul Kalam: A Visionary who walked ahead of times and a seminar on APJ: The Legend . Realising the importance of organic farming in future NSS have been taking initiatives to spread awareness and promote organic farming. NSS unit organized a state level workshop on Manufacturing of Organic Pesticides in association with Krishi Bhavan Angamaly. In collaboration with Angamaly municipality, Krishi Bhavan, G.K Nursery, Nayathodu, and Kerala Agricultural Technical Staff Association (KATSA), NSS unit launched a project Ammayukku oru thottam . This project includes building up 1000 vegetable gardens in selected houses of 30 wards of Angamaly muncipality. A group of 5-6 students were taken to each ward, accompanied by an Agricultural Assistant, a Farmer and corresponding Ward Councillor, where they planted 25 saplings in each house, using 1 Kg of organic pesticide. Ernakulam District Collector Mr. K. Muhhammed Y Safarulla IAS, inaugurated this project. NSS unit always volunteers in providing financial aid for the needy like cancer patients and also contributes to those projects which demands the call and attention as initiated by the university like Chennai Relief fund. Every year Volunteers collects Toiletries, stationary materials, Dress materials from students to refugees as a part of Swanthana . NSS unit has collected e-wastes from students and was given to Clean Kerala Company. Also e jaalakam classes were organized for all first year students. Every year one of the students are selected on the basis of their performance as the Best NSS volunteer of the college, also Best Camper and Best Entertainer awards are instituted. On April 22nd 2017 NSS volunteers of our college participated in the Ente Kulam Project, which is an initiative by Ernakulam District Collector, to clean 100 ponds in Ernakulam. District Collector Sri. K. Muhhamed Y. Safarulla along with Muncicipal Chairperson Smt. Gracy Teacher, Nodal Officer Sri. Anoop visited the work sites and encouraged the volunteers for their effort. On 5th June 2017, NSS unit of our college observed World Environment Day. The Programme included planting of tree saplings in the campus, distribution of tree saplings to students, and construction of rain water recharge pit. A poster competition on the topic “Connecting People to Nature” was also organized. Manasa S of II B.A Englisgh won the first prize, Sulthana P.A and Amrutha Thomas of II B.Sc FCS shared the second prize in the competition. A Blood Donation Campaign was organized on 13th June 2017 in association with Regional Blood Bank, Aluva. Vice Principal Rev. Dr. Sr. Philo T.J. inaugurated the function by lighting the lamp. Dr. V. K Krishnankutty and Mr. T. V. Victor, official from Regional blood bank, Aluva coordinated the camp. NSS unit of Morning Star Home Science College observed International Yoga Day on 21st June 2017. The Programme included a mass drill, a seminar and an Inter-departmental Yoga Competition. Programme officer Ms. Neenu Mary Thomas, welcomed the gathering to the seminar by Ms. Manju P.V on the topic “Yoga for Health”. As per the notification from Angamaly Municipality and Government of Kerala, NSS unit organized a camp on ‘Cleanliness Prior to Monsoon’ on 10th July 2017 in the Campus. Students from different departments actively participated in the Campaign. NSS unit of our College collected dresses for the inmates of home for poor on 21st July 2017. First Minicamp for the year 2017-18 was held on 29th July 2017. Mrs. Suma Saburaj, Member, Nedumbassery, Grama Panchayath, inaugurated the camp She exhorted the students to participate in such camps organized by NSS to promote social commitment. The Programme included cleaning of Campus premises. Ms. Neenu Mary Thomas offered a training programme on Jaivam, It was to prepare the students prior to the seven day special camp. Principal Rev. Dr. Sr. Rosily A.V addressed the volunteers. NSS unit observed Hiroshima-Nagasaki day on 9th August 2017 to mark the tragedy of the fatal bombing in 1945. The programme included a talk and documentary show. NSS unit collects Noon meals from all staff and students on the first Friday of every month for the inmates of Abhayabhavan, home for poor. On 15th August 2017 Independence Day was celebrated at the campus by hoisting National flag in front of Science Block. Principal Rev. Dr. Sr. Rosilty A.V conveyed message for the day followed by flag hoisting. Agristar is a group of students of Morning Star Home Science College who are interested in agriculture, especially organic farming. This is headed by Principal Rev. Dr. Sr. Rosily A.V. It aims at fostering interest in agriculture, providing opportunities for hands on training in farming, providing awareness to the society on the need of organic farming and extending its aid to the society. The official inauguration of Agristar commenced with the creation of kitchen garden at Government L.P School, Peechanikkaad. The programme was conducted in association with NSS unit and Krishibhavan, Angamaly Muncipality. Mrs. Gracy M.A inaugurated the programme. Councllor Mrs. Shoby George presided over the function. School Head Master C.N Nandakumar welcomed the gathering. Agricultural Officer proposed vote of thanks.